1. Supplies needed to start. You need good tools to help create a fine painting. 2. The proper way to use: brushes, paints, canvases, easels, pallets etc. 3. Color mixing - mixing the colors of the color wheel plus earth colors and all of the grays. 4. Elements of drawing, design and perspective. 5. How to choose a good subject. 6. How to start a landscape and still life. 7. Understanding value and tone (darks and lights). 8. Working with rich color and texture. 9. Creating a focus in your painting and sticking with it. 11. Applying elegant calligraphy (tree limbs, beach grass, etc.) to your paintings. 12. Techniques to keep your color clean and pure. 14. Learn how to critique your own work. The 20 elements to look for in every painting. 15. 100+ categories to paint. Turning everyday scenes into fine paintings. 16. Learning to shoot photographs for paintings. Looking for light , mood, design, etc. 17. Building up a reference file using photos. Clouds, boats, sunsets, trees, etc. 18. Building a painting. Starting with large shapes first and adding the smaller shapes. 19. Framing ideas and techniques. When to use liners, how much to spend, colors, etc. 20. List of all resources - suppliers, books, equipment. 21. Plus many other subjects. Learn how to start a landscape, a still Life, a cityscape and a portrait. The initial design is key. We all have seen beautiful etchings or drawings in museums that are absolutely wonderful, without any paint or color. They stand alone because of the DESIGN and DRAWING. We will always start with a great design drawn before we proceed with the painting. We begin a painting with the 4, 5, or 6 of the largest shapes. You then fill in the shapes with an average color and start to add the smaller details and colors. It's a step by step organized approach to starting a painting. When you solve problems logically and slowly you will have the best chance of creating a successful painting. I will do a Demonstration each morning. I will show you how to start and design a landscape. On the second morning, I will demonstrate how to layout and start a still life. Learn how to mix all of the colors of the color wheel , plus the earth colors, plus all of the grays. Painting with only the 3 primary colors: yellow , red and blue. Bring your camera and we will photograph the surrounding park. 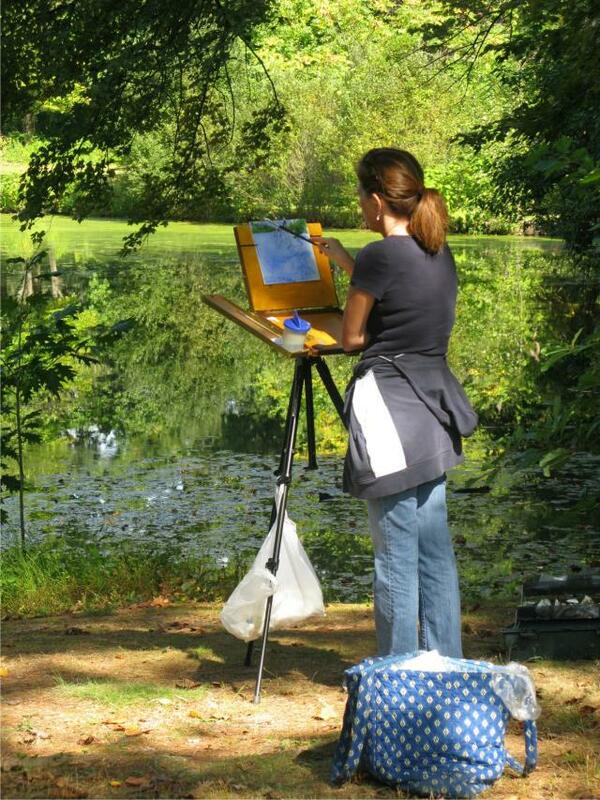 Learn to photograph for potential paintings (seeing the shapes, the light and the design). Our goal is to create a good design in your photograph. Getting the design right in your photos, will save you much time later in laying our your painting. to see and understand what needs to be done on your painting and how to fix and improve it.